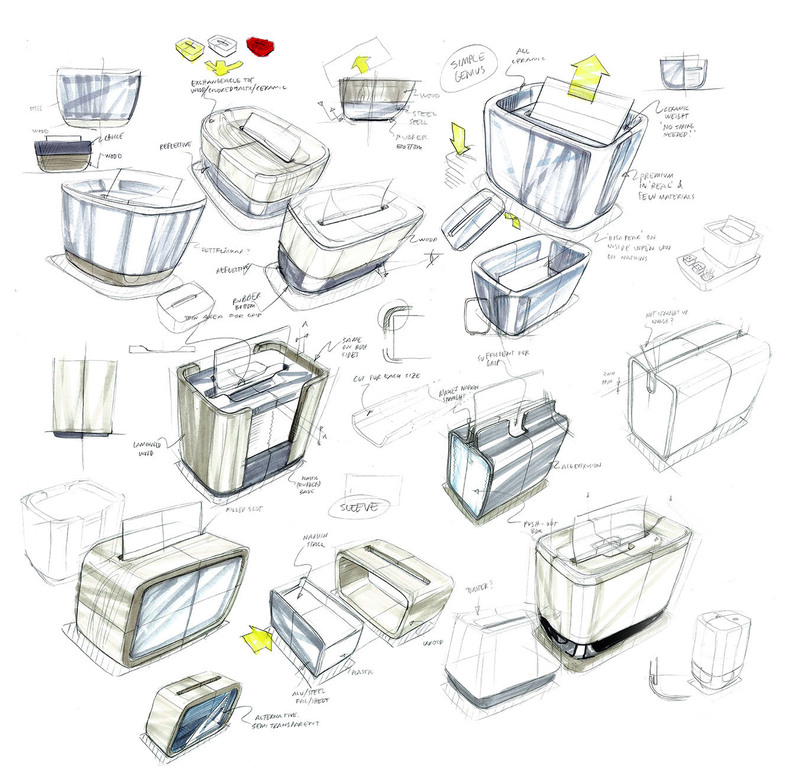 As the lead designer for a new range of the Tork Xpressnap® napkin dispensers for SCA, I was challenged to create a napkin dispenser collection ideal for high-end establishments that prioritize creating a premium dining experience. After analysis of the different environments the dispensers would be used, alignment with the Tork brand vision, and careful consideration of innovative and unexpected materials, we desigend the containers in two distinct styles – sleek aluminum and genuine walnut – each designed to fit seamlessly into a variety of modern foodservice venues. 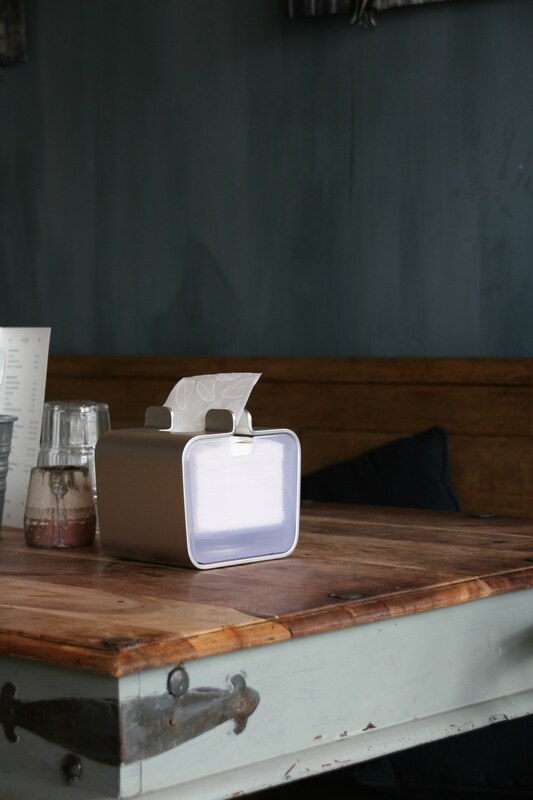 Aluminum Edition Made of high-grade aluminium, this innovative dispenser provides for a stylish presentation of the paper napkins while supporting consumption control. By combining the sleek aluminum with transparent plastic, it was possible to create a striking and seamless design that did not sacrifice the function of seeing the level of napkins inside. The intuitive and easy-to-use refilling system prevents overfilling and ensures that wrinkle-free napkins are always ready to hand. The dispenser comes in two different sizes. Red Dot Product Design Award 2014 Walnut Edition Made of genuine walnut, this dispenser was developed for foodservice establishments pushing the boundaries on providing well designed and functional interiors. 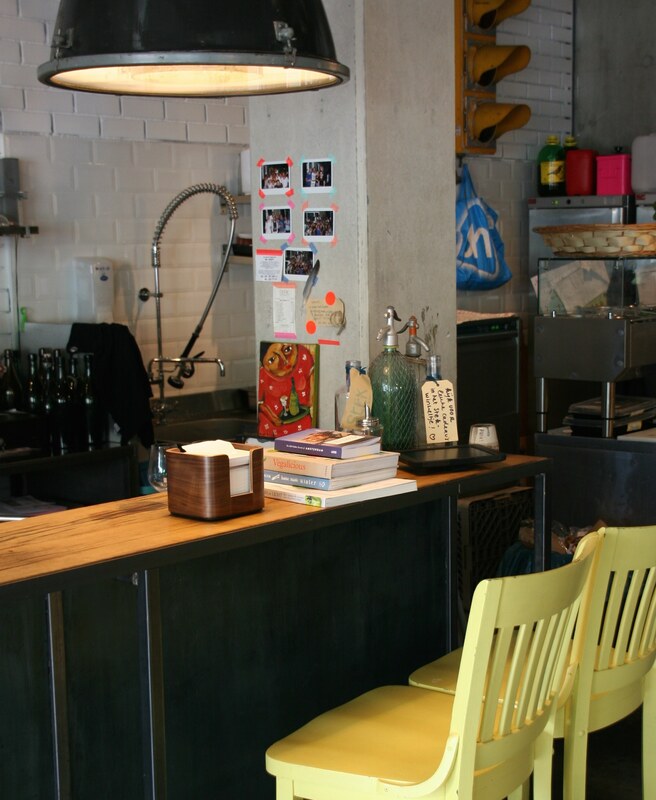 An unexpected touch that is able to elevate how people perceive disposable items like napkins. By leveraging aritisan methods normally used in high-end furniture concepts we were able to create something deliberate and considerate out of a simple object that is often not noticed. Like the Aluminum edition, the easy-to-use refill system prevents overfilling and ensures that a high quality, wrinkle-free napkin is at hand as needed. 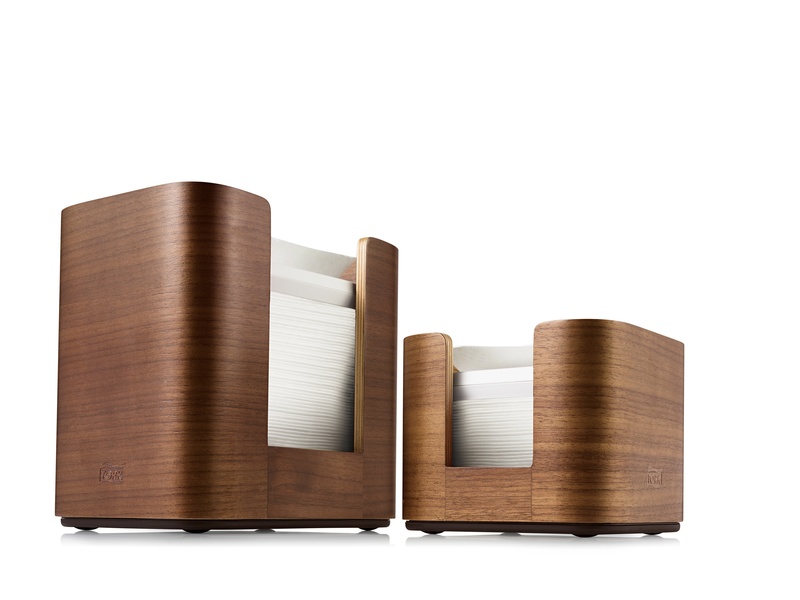 Red Dot Product Design Award 2014 This project was designed with the team at Zenit Design. Read more at SCA-Tork. As the lead designer for a new range of the Tork Xpressnap® napkin dispensers for SCA, I was challenged to create a napkin dispenser collection ideal for high-end establishments that prioritize creating a premium dining experience. After analysis of the different environments the dispensers would be used, alignment with the Tork brand vision, and careful consideration of innovative and unexpected materials, we desigend the containers in two distinct styles – sleek aluminum and genuine walnut – each designed to fit seamlessly into a variety of modern foodservice venues. Made of high-grade aluminium, this innovative dispenser provides for a stylish presentation of the paper napkins while supporting consumption control. 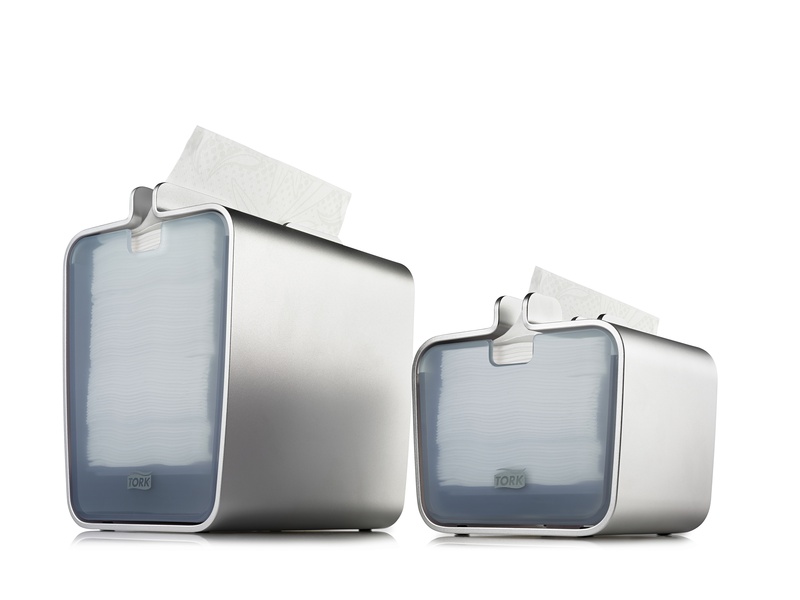 By combining the sleek aluminum with transparent plastic, it was possible to create a striking and seamless design that did not sacrifice the function of seeing the level of napkins inside. The intuitive and easy-to-use refilling system prevents overfilling and ensures that wrinkle-free napkins are always ready to hand. The dispenser comes in two different sizes. 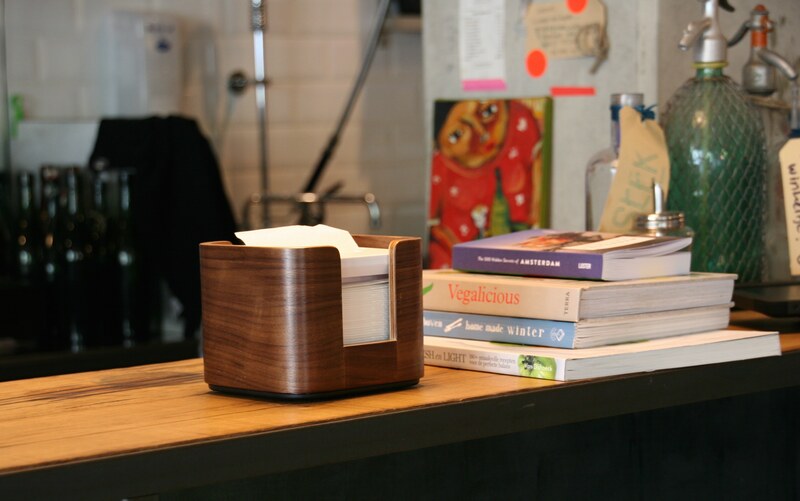 Made of genuine walnut, this dispenser was developed for foodservice establishments pushing the boundaries on providing well designed and functional interiors. 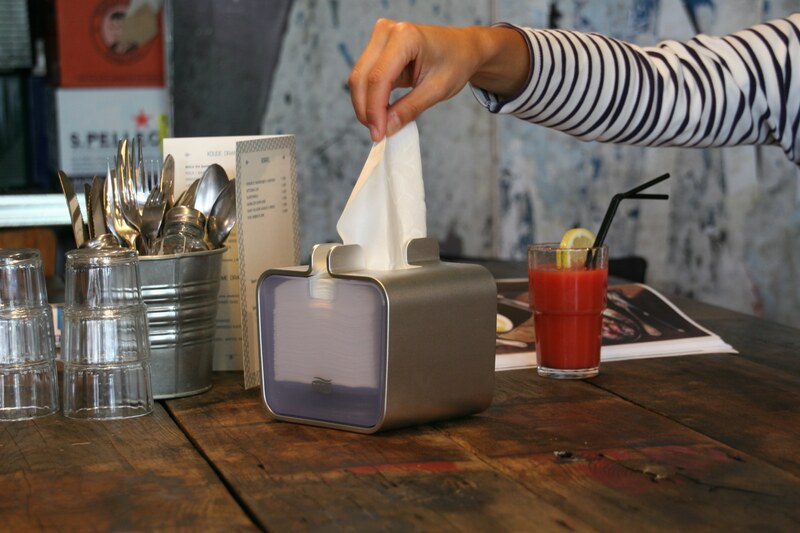 An unexpected touch that is able to elevate how people perceive disposable items like napkins. By leveraging aritisan methods normally used in high-end furniture concepts we were able to create something deliberate and considerate out of a simple object that is often not noticed. Like the Aluminum edition, the easy-to-use refill system prevents overfilling and ensures that a high quality, wrinkle-free napkin is at hand as needed.